Gas-fired infrared heaters operate by first heating a gas-air mixture inside of ceramic or steel tubing and then using an in-built fan to push the hot gas through the tubing network. Infrared heat is radiated from the tubing, and often, directed by heat reflectors to hit the desired target. ATI of New York provides a wide range of infrared heating and ventilation products that work efficiently both indoors and out, both for spot heating and room heating, and can save you 20% to 50% on fuel costs as compared with forced air heating systems. Infrared heat travels directly from the heat source to the object to be heated, be it a concrete floor, a wall, a piece of equipment, or a human being. There is no waiting to first heat the intervening air, and indoor spaces are heated from the floor up instead of from the ceiling down. Heated objects re-radiate heat into the surrounding air, and they retain most of their absorbed heat even when contacting outdoor air. Conduction of heated air does ultimately occur, but there is no need to wait for it before feeling the warmth. Additionally, there is no circulation of dust particles as with forced air heating. Detroit Radiant Products (DRP) has been a manufacturer of high-quality infrared heating equipment since 1955. They custom-design their heaters for optimal use in warehouses, storerooms, factories, auto garages, car washes, fire stations, pole barns, and more. 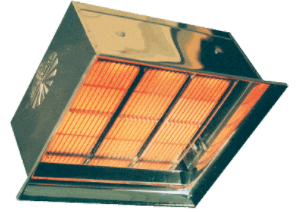 They make both high-intensity heaters, which are typically unvented and used for spot heating, and low-intensity heaters, which are popular in both vented/unvented models. Some of their heaters are also two-stage, allowing you to alternate between high/low settings and save up to 35% on fuel consumption. You can click on the product links above for more information, and ATI can assist you in selecting and learning to operate your new infrared heater.